Note: This event is over. Please sign up to our newsletter to be notified of similar future events. 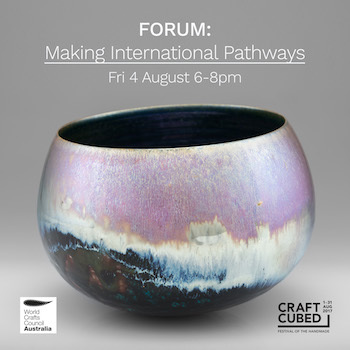 Join us for this informative forum panel followed by Q&A session, to hear about some exciting pathways to reach international audiences for ceramic artists. Hosted by Slow Clay Centre in collaboration with the World Crafts Council Australia and Garland Magazine, we have invited three experienced ceramic artists to discuss their international experiences and to answer your questions.The speakers Penny Byrne, Greg Daly and Dean Smith will present their pathways accompanied by visuals and we will have a full hour for Q&A afterwards with MC Dr Kevin Murray (WoCCA and Garland). Content: There are many opportunities to present work to international audiences. The Asia Pacific region has a number of significant craft fairs and biennales. How does a craft artist break into these circuits? 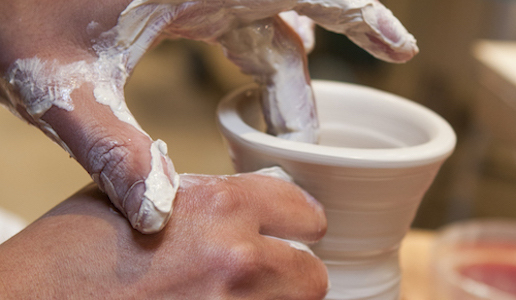 The World Crafts Council has an Award of Excellence program. Is it worth my while to enter? How do I find out about residencies and exchanges? What value is professionalism and presentation? In a time of putting “Australia First”, what’s the value of looking abroad? Penny Byrne‘s sculptural works are politically charged, highly engaging and often disarmingly humorous. Byrne’s work presents an ongoing inquiry into popular culture and international politics. In 2015 Byrne exhibited in Glasstress Gotika, a collateral event of the 56th Venice Biennale. She is represented in the UK by Coates and Scarry and in Berlin by Michael Reid Berlin. Greg Daly is internationally known and respected as a ceramic artist specialising in rich glaze effects and was lecturer in ceramics at ANU Canberra. His work has been included in 24 international book publications and is held in 80 national and international art galleries and museums collections, including those of the National Gallery of Australia and the Victoria & Albert Museum in London. He has also exhibited in over 200 international and national group exhibitions. He is past President of Craft Australia. Dean Smith works with special effect high fire glazes combined with low fire enamels and precious metal lustres. Smith’s work has featured in important national and international ceramic exhibitions and has won several major awards, including the Silver Prize, Taiwan Ceramics Biennale 2012, Special Citation, 8th Cheongju International Craft Competition, South Korea 2013, winner, Clunes National Ceramic Award, 2013 and winner, Vase Finder International 9th Annual Exhibition, USA 2014. Kevin Murray, our MC for the event, is secretary of the World Crafts Council – Australia and editor of Garland magazine. He is a writer and curator and has held the position of Artistic Director and CEO of Craft Victoria. This event is part of the annual Craft Cubed Festival, by Craft Victoria. Slow Clay Centre is located at 13 Keele Street, Collingwood. Jump off at the Keele Street stop on Tram 86. Please choose your course carefully as we do not give refunds if you change your mind.